If you ever have the chance to visit our airplane propeller manufacturing headquarters in Piqua, Ohio — and we hope you do — you will notice that there are several companies in Piqua that share the “Hartzell” name. George Hartzell made a permanent impact when he set up shop in this small town. One of our co-named neighbors is Hartzell Air Movement. The firm was founded within Hartzell Propeller in 1927 to improve factory air quality. 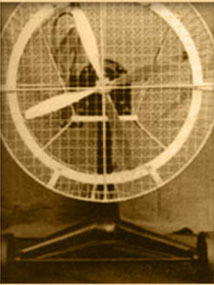 By 1970 Hartzell Air Movement, then called Hartzell Fan, had manufacturing facilities in three states. Recently, Hartzell Air Movement released some fantastic news. They will be providing state of the art centrifugal fans to the second largest wastewater treatment facility in Colorado. These 66” fans will perform critical work removing hazardous gases from the facility. The Hartzell team is proud to see a company which shares our name and history of technological innovation primed for a fantastic year. To find out more about the shared history of Hartzell Propeller and Hartzell Air Movement, visit our history page. To learn the details of this fantastic news and the new business it is bringing to Piqua, you can read the original article here.